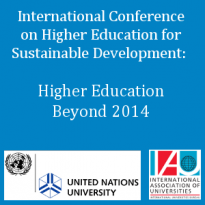 The IAU is pleased to report that the International Conference on Higher Education for Sustainable Development: Higher Education Beyond 2014, which took place at Nagoya University on 9 November 2014, was a great success. Co-organized by UNU in collaboration with UNESCO, the United Nations Department of Economic and Social Affairs (UN DESA), UNEP, UN Global Compact Principles for Responsible Management Education (PRME) initiative, and the International Association of Universities (IAU), this conference brought together 700 participants from all over the world, including many representatives from the IAU community! Marking the closing of the UN Decade of Education for Sustainable Development (DESD 2005–2014), the Conference celebrated the achievements of various higher education initiatives throughout the Decade and renewed commitments to make continuing making profound contributions to Education for Sustainable Development (ESD) beyond 2014. The Conference highlighted the major challenges and pathways for the transformation of higher education institutions (HEI), with a focus on scaling up and mainstreaming innovative practices in learning and knowledge development and research. The Conference reexamined the commitments made by HEIs at the UN Conference on Sustainable Development in 2012 (Rio+20), including the Higher Education Sustainability Initiative facilitated by a group of UN partner organizations, including the IAU. The Conference included high-level panel sessions that focused on the major areas of transformation and development of HEIs, as well as on innovative ways to advance sustainable development. The issues discussed in the panels were further explored in breakout sessions that were organized into five sub-groups: (1) advancing policy; (2) transforming learning and training environments; (3) capacities building of educators and trainers; (4) empowering and mobilizing youth; and (5) accelerating sustainable solutions at the local level. The outcomes of the Conference have been presented in the Workshop on Higher Education and Research coordinated by the IAU and HESI at the UNESCO World Conference on ESD, which took place immediately after in Nagoya, Aichi, Japan from 10 to 12 November 2014.